The Navy says 10 sailors are missing and five others are hurt as the USS John S. McCain sustains damage. SEOUL — Ten U.S. Navy sailors are missing and five have been injured after the USS John S. McCain guided missile destroyer and an oil tanker three times its size collided near Singapore early Monday. American and Singaporean ships and helicopters are involved in a search-and-rescue mission after the pre-dawn collision at the entrance to one of the world’s busiest shipping lanes. This is the second time in two months that a Navy destroyer based at the 7th Fleet’s home port of Yokosuka, Japan, has been involved in a collision at sea. Seven sailors were killed when the USS Fitzgerald collided with a container ship south of Japan in June. 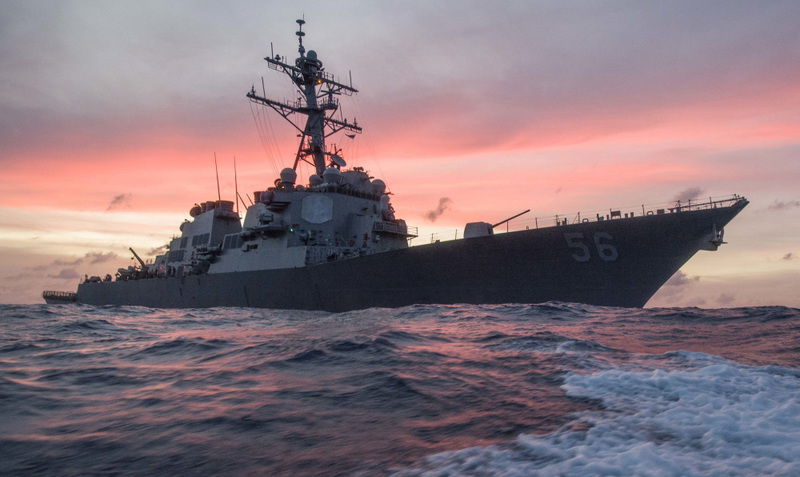 The McCain, an Arleigh Burke-class destroyer built at Bath Iron Works in Maine and equipped with Aegis missiles, had been on its way to a routine port visit in Singapore after patrolling in the South China Sea. Shipping data showed that the Liberian-flagged merchant vessel Alnic MC was also on its way to Singapore when the vessels collided east of the Strait of Malacca at 5:24 a.m. local time, while it was still dark. The 550-mile-wide strait runs between the Malaysian peninsula and the Indonesian island of Sumatra, connecting the Pacific and Indian oceans. It is one of the world’s busiest shipping lanes, but is also well traversed and well governed, analysts say. The Alnic is more than three times the size of the McCain, with a gross tonnage of 30,000 tons. The Navy’s 7th Fleet said that Navy Seahawk helicopters and Ospreys had been mobilized for the search-and-rescue effort, joining tugboats from Singapore, a Singapore navy ship and helicopters, and a Singapore police coast guard vessel. This collision comes just days after the Navy issued a damning report listing errors that led to the collision between the USS Fitzgerald – also a Yokosuka-based Arleigh Burke-class destroyer – and a much larger ship. Euan Graham, director of the international security program at the Lowy Institute in Sydney, called it “extraordinary” and said it would certainly lead to pointed questions being asked within the Navy. But the incident also could affect the 7th Fleet and its readiness, Graham said. The USS McCain is named after the father and grandfather of Sen. John McCain, R-Ariz. John S. McCain Sr. and John S. McCain Jr. served as admirals in the Navy during World War II. A Navy website says the McCain carries a crew of 338.